Bill’s Bill’s Bill’s: The restaurant not the wonga. There is something to be said for hitting up a restaurant chain rather than taking a chance on an unknown non-tried non-tested eatery when you have small kids in tow. I’m all for hipster independents but somehow I just can’t find the courage to branch out. When you find a restaurant or cafe which you can just about bare to sit in public with your whiny, fussy, fidgety critics, it’s worth repeat visits. Even better if that chosen restaurant or cafe is a chain – wherever you are, it can be relied on. You will know the score. 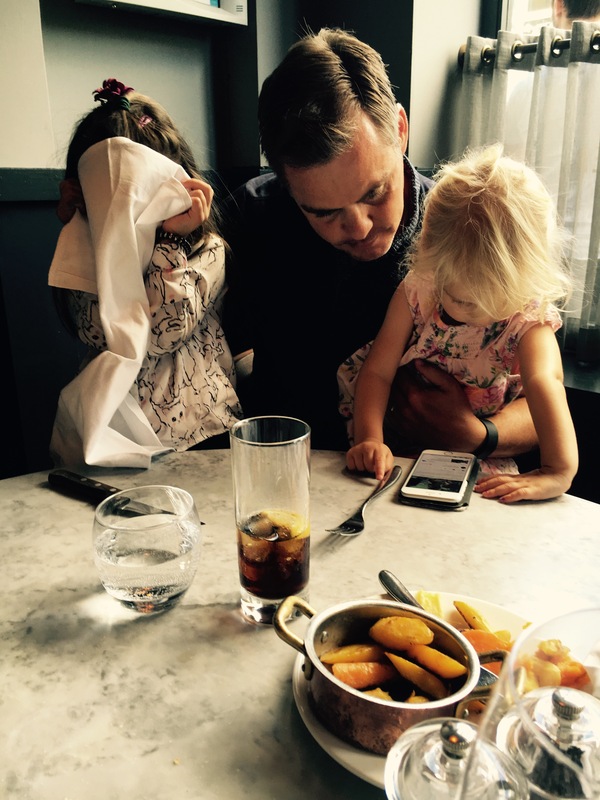 Do not deviate from what works, never shake up the system… This is my dining out mantra with my under 5’s. This is why I could recite the menu at Bill’s to you. Ask me anything?! Blueberry pancakes: check. 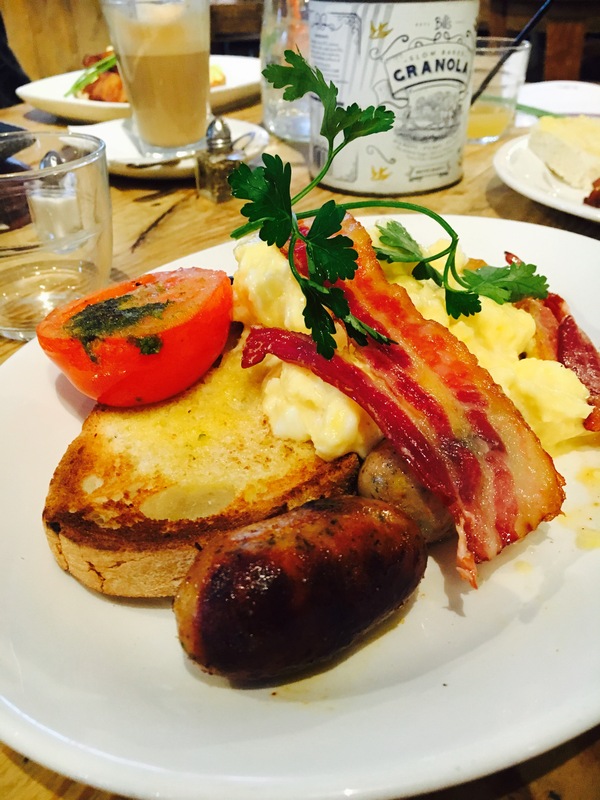 The Bill’s awesome breakfast (no halloumi sides allowed until midday) is always a total delight, guaranteed to put me in a good mood. Bacon is done extra crispy on request. The Bread basket assortment can indeed be made up entirely of Pain au Chocolat for your precious 5 year old. Viola! It seems to be no problemo. That is what I like, no, what I LOVE about Bills: Great food, no hassles. I feel quite hip and cool when I’m in there too – I imagine this is what all the haunts surrounding Borough market must look like these days. Selling produce on crate shelving, mis matched battered chairs around scrubbed wooden tables. Giant metal tea pots that sort of go together but never 2 the same., cutlery in old battered looking tins in the middle the tables and chalk boards suspended from the exposed ceilings: Feeling totally current right now…!! Quirky: In just the right dose to be acceptable with 2 minors in tow. 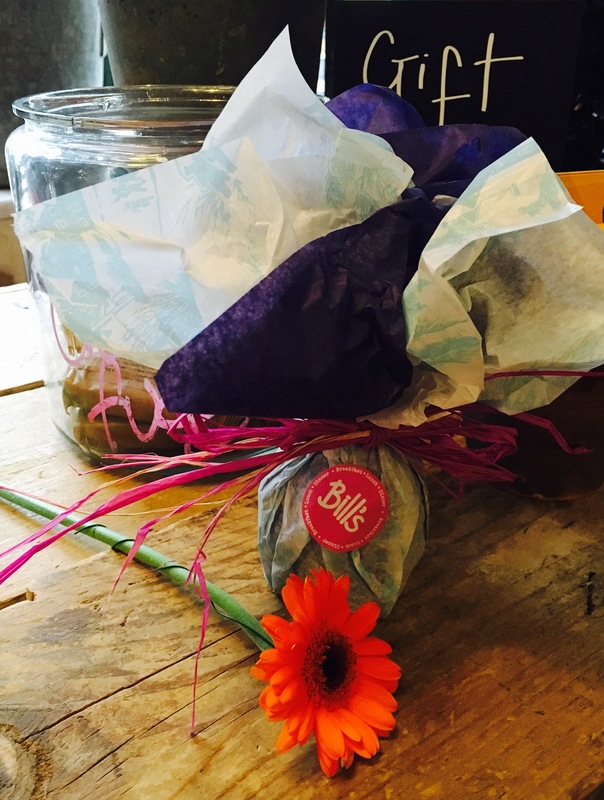 Our latest Bills breakfast sesh was on Lila’s 3rd birthday. Talk about spoiled, the girls were each given a flower at first, then along came a couple of stickers (proper sub-5 year old goals) before out of nowhere our Topshop-cool of a waitress produced 2 beautifully wrapped bags of chocolate drops. I’m not saying this is the norm for birthday shenanigans – it might be! But it prompted me to shout about what a blooming great all rounder Bill’s is. 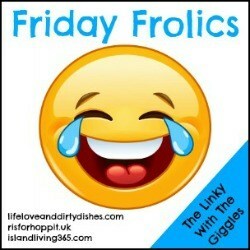 I don’t know many places that I would happily take the kids too, AND have a boozy night out with my girlfriends. Oh yes, it’s happened at Bill’s. Their dinner menu is gorgeous – with plenty of halloumi on it at this time of the day! There are cocktails and prosecco to fest on, and a candlelit atmosphere that flatters even the most trowelled on contour-less make up (that’s me – this place rocks after dark!). Our favourites are the Lewes (the original and legendary 1st Bill’s), Eastbourne -which is brand new, but somehow looks like it has been there for decades with its distressed interior) and Brighton, which I struggle to get a table in it’s so popular! There are over 60 Bill’s around, so there is bound to be one near to you! Thanks Bill – we totally dig your vibes. Today is the first time in a long time that I have had to bite my lip to stop myself from crying in public. This used to happen a lot in the early days, and mostly because we were making Rookie mistakes like attempting to go clothes shopping with a baby in tow. Or supermarket shopping with an 18 month old hooligan. I have since discovered shopping on line is the only way to remain clothed, and fed. 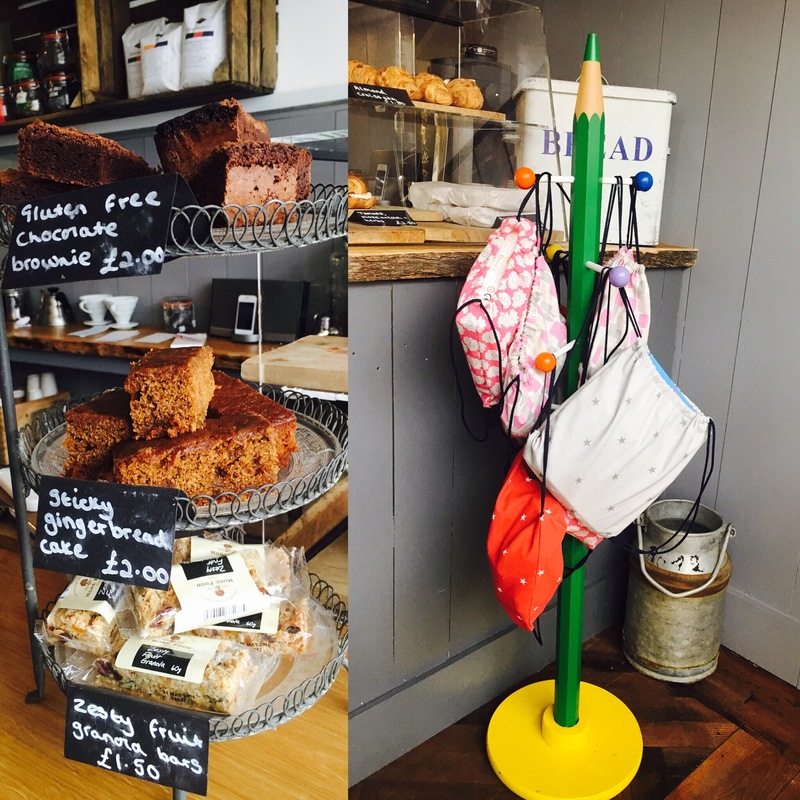 A while ago I began a quest to seek out the most child friendly eateries around where we live, East Sussex. I have now become a fully fledged food reviewer (dream gig for me… Nom Nom Nom!) So far we have been to Uber-kid friendly territory, easing ourselves in gently if you will. 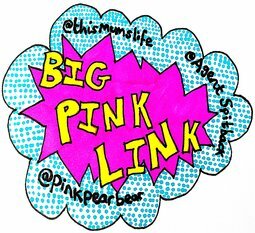 Today we had what I thought would be a real treat of a review: one of the best restaurants in Brighton (and one I’ve been dying to try but can never justify the huge price tag) wanted us to come and review their Sunday lunch menu, with a true family slant. Careful what you wish for: Family slant is exactly what they got. How can I put this; we were the Ying to their Yang. The restaurant wasn’t just classy, it was classy with a touch of Mega Chic. By contrast our 2 year old ToddlerMonster was living up to her namesake, whilst our fiveanger was exactly that. I naively assumed that the girls would be as excited as I was to try 35 day dry-aged roast sirloin of beef. They were not. Not remotely. The food and service were top notch, seriously outstanding, unfortunately today was the day that our children decided to turn up the notch on Demon Mode. Lila, (The ToddlerMonster) would not be consoled. A machine-like-whinge had been especially programmed in and it would not be stopped for anyone. Oh, hang on, it did stop to watch her beloved YouTube as our last ditch attempt to save the other diners ears and tempers. She likes to watch this American family who film themselves going about their daily business: Today she was watching them in a traffic Jam. I’m not kidding. Yey, It was dreamy. I could feel my stress levels rising as the restaurant filled up with lots of people adulating, all set for a swanky splash the cash Sunday lunch. The waitress staff were on the level, They were lovely! In fact I wanted to ask them to join us. The 1:1 ratio needed bumping up a bit. The main event arrived and I have to say it looked incredible. The kids were delighted to see enough gravy to sink a battleship, the largest, thickest cut of beef with the biggest roast potatoes I have ever laid eyes on. It came as one big Sunday roast sharing platter which is a really lovely idea. The girls were finally quieting down. I had a glass of Melbec. Toddlermonster had indeed ‘done a wee’. Her nappy had clearly hit capacity but as I had been so busy farting around trying to get some decent food shots, I had failed to notice. The wee was spilling off the highchair and splashing onto the floor tiles below. A sort of waterfall effect. Our daughter was peeing on the floor, we had to let her finish. I would have been horrified if this had happened in McDonalds, let alone this Uber-Chic haunt. I’m not sure who was more mortified, Lila or I. The oversized napkins came in handy as I wrapped it around her waist to make the trek through the length of the restaurant slightly less conspicuous! The waitress deserved a gold medal (or the huge tip we left), by the time we arrived back at the table it had all been cleaned up. Good as new! By this point the girls were past the point of being reasoned with. I bribed them with a chocolate lolly each to buy Dan and I a few minutes to throw this decadent roast lunch down our necks. I have to say, it really was the king of roast lunches. The straw that broke the camels back, or should I say, the point where the prickly eye cry feeling crept up on me wasn’t the peepee incident. It was when Dan made a dash for the loo before we left. That was it, as soon as dear daddy was out of sight ToddlerMonster kicked off BIG TIME. She went shitcrazy bonkers. Right in the middle of the restaurant, screeching,“My Daddy, my Daddy”, at the top of her voice in between deafening sobs. She had been working up to this very moment, and the girl let rip. The dead weight back arch was in play. No amount of consoling or begging was going to stop her. Everyone was looking up from their fortune lunch plates. I had to carry her out to the street, leaving our bags behind, like she was a hot sheet of screeching metal. I have no idea if we shall ever be asked to review somewhere ever again. For now, I’m not sure I really care. If you have a disaster dining story, please share. I really think I would take comfort in your nightmares right now!! 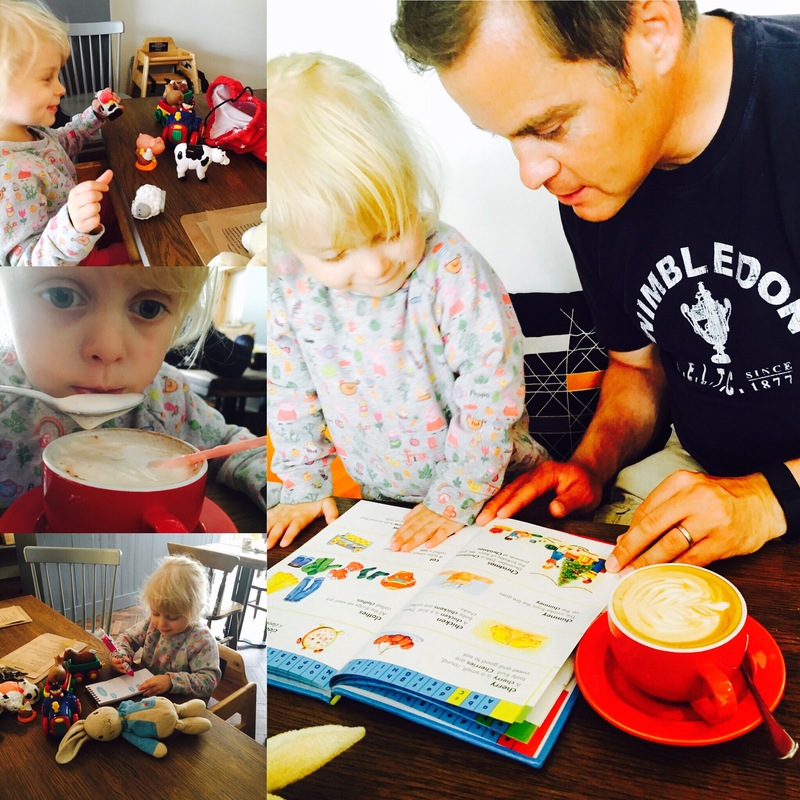 Baca’s Coffee Bar: A toddlers eye review. Armed with my ToddlerMonster, we stepped into the very chic coffee bar. A cool grey is the back drop for a collection of vintage mirrors, with shelving crates from the local farm shop, and coffee pots from all corners of the world. A stripped back bar gives off a relaxed rustic feel, but, more importantly, is keeper of the most delicious looking homemade cakes and pastries. The vibe is effortlessly cool here. Not mumsey. Not one bit mumsey. Hurrah! You would be forgiven for momentarily forgetting you were in Seaford, and instead bang in the middle of the Brighton lanes. 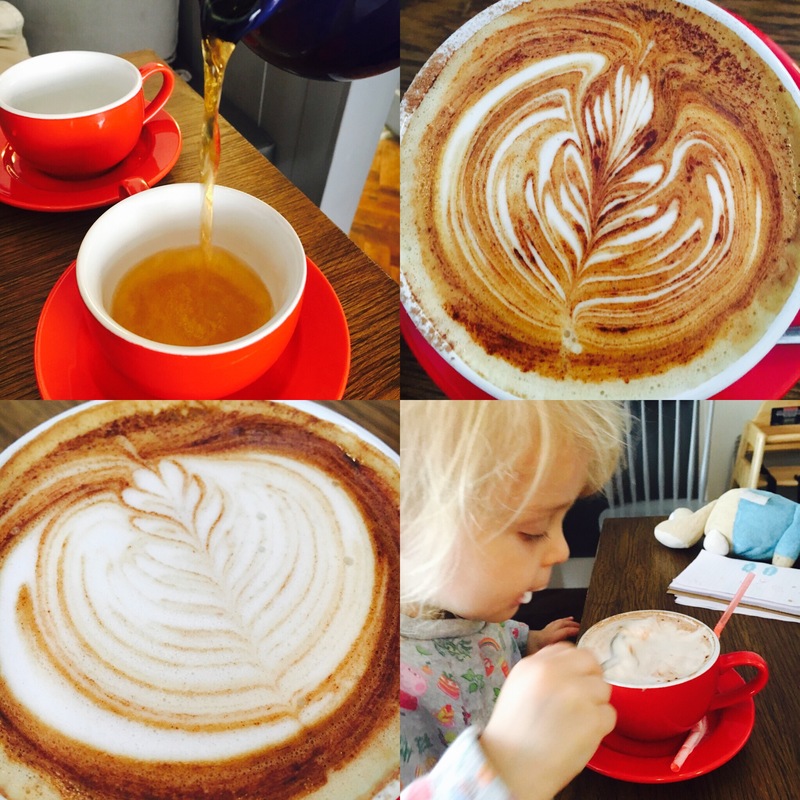 The owners of Baca’s Coffee Bar are a husband and wife team who have small children of their own- so they get it. They get that children don’t sit still without a very good reason. They get that children can be fussy eaters. But most importantly they seem to appreciate, and not mind, that their pint sized clientele come with the loudest of voices! 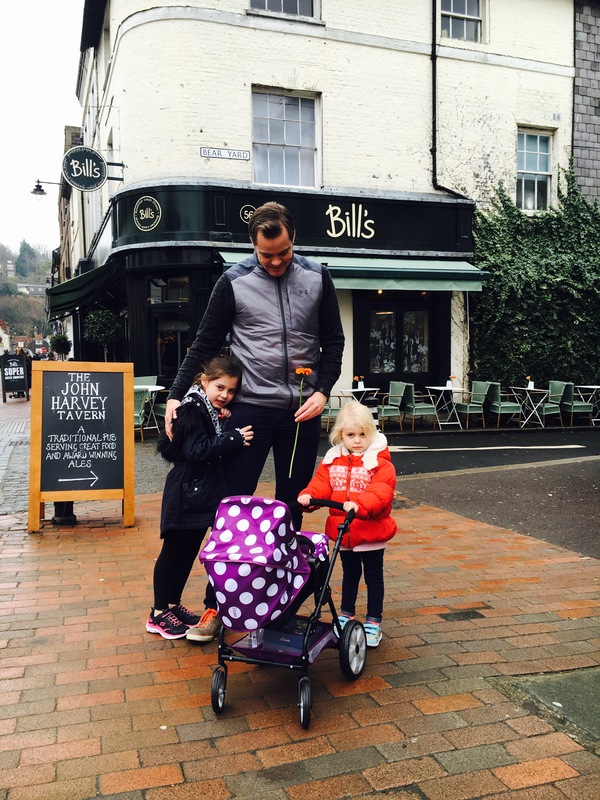 The warm welcome immediately put me at ease – there were plenty of highchairs, and the buggy was stored without fuss. But the best surprise, the bit that had ToddlerMonster’s eyes on stalks was the toy bag tree! Let me explain… Here, was a giant pencil standing in the corner, with different coloured drawstring bags hanging from it- all for the taking. A different surprise in each one (yes Lila checked..!). Farm animals, a train set, books, stickle bricks, card games. What a frankly genius idea! I must mention too the well stocked big-enough-for-a-buggy, loo. Spotless, with a change matt, wet wipes & paper towels. All that a parent could wish for! But let’s get to the crux of it. The coffee. It’s quite clear that coffee is at the heart of Baca’s. Namier, the owner, explains that the Horsham Coffee Roaster supplies them with a unique Benchmark single origin Brazilian coffee – only available on a seasonal basis. Now, I’m not going to pretend that I understood exactly what that means, but what I did understand is that this is rare and makes Baca’s unique in this area. I was urged to try the coffee without my usual large dose of sugar, reluctantly I did. Smooth, rich, naturally sweet, not bitter. No, I’m not talking about my husband. Great lengths have been gone to, to ensure that everything served at Baca’s has been locally sourced. The cakes are made by a fellow Muma in the town, the meat comes from a butchers a few miles down the road, as does the bread. Even the milk is bought directly from the dairy farmers rather than a wholesaler. This is a café with a conscience, and with such I can enjoy the crumbly almond croissant, or a slice of the delicious Bakewell cake (almost) guilt free. On this occasion I devoured the Portbello mushroom, gruyere cheese and thyme toasted on Norfolk multi grain bread. D-E-licious. Hiding behind that rustic, urban decor is a café that has munchkins firmly at their heart. 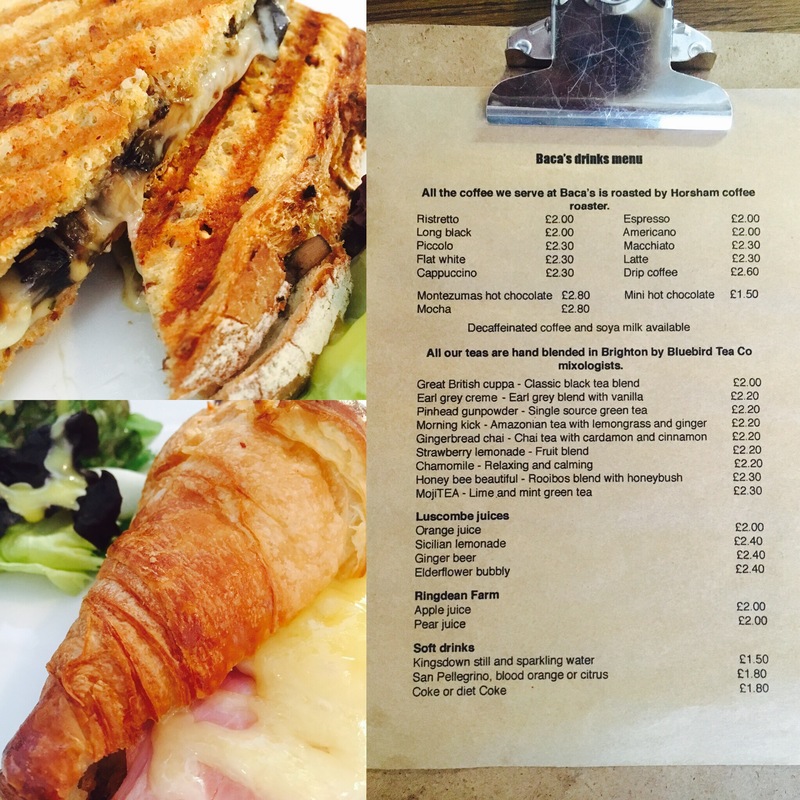 A great addition to the towns thriving café culture and a welcome new addition to my weekly routine! Bravely going where we have never gone before: A restaurant…on a Saturday evening…with the kids! Ok, it was 4pm. But in my little girl’s world they were OUT OUT. I LOVE eating out. It’s probably my favourite extracurricular activity actually. Date nights, girls nights… But never really managing to combine the offspring element successfully. To be honest we have had our fair share of car crash restaurant attempts in the past. All of which ending with hubster and I stressing out over the mayhem we are causing, and eating in shifts while the other ‘entertains’, sorry, CHASES the girls as they flee like ants in opposite directions. On the whole it’s been a waste of money: and not just on the amount of wine I have to buy on the way home to compensate. ToddlerMonster is now the grand old age of 2, and Darcie is school age so we are going to give dining out another go… We are embarking on a bit of an Odyssey I think I’ll call it, this Spring, in an attempt to find the most toddler friendly food haunts near to where we live in East Sussex and hopefully start over on the family dining front. The key to this will be finding REAL family friendly restaurants. Not just the ones that claim they are but actually once you are over the threshold discover that they have an aeroplane sized loo with change facilities that wouldn’t look out of place in the Trainspotting film, have zero space for your buggy (they cost more than some cars, I will NOT be leaving it outside), together with a limited and overpriced kids menu. So, first up is Las Iguanas in Brighton. On this occasion we were given something towards our bill BUT I will be assessing with completely independent toddler eyes! We were offered a highchair and told for every adult main ordered, a child can eat the Niño’s (child’s) set menu for free! Result: no need to stress about them ordering something they weren’t going to eat as it was the bargain price of FREE. My favourite. This was shortly followed by the bloody brilliant news that it was 241 cocktails on a selected 25 drinks to celebrate Las Iguanas 25th anniversary. This is going to be offered ALL YEAR! I’ll drink to that. And I did: 241 Caipirinhas. Despite this offer they hadn’t scrimped on units, I wouldn’t even let Darcie dip her finger in! We were spoilt for choice over what to order: the menu was as funky looking as the room we were sat in, literally bursting with that Latino feel. It was great to see a kids menu which didn’t just have the standard pizza & chips type combo featured too. Although that’s exactly what Lila wanted to have. The kids deal is £5.90 which includes a main course (7 options to choose from) a dessert, and a drink. Darcie played it safe and doubled up on carbs with Macaroni pasta and chips. Each of their mains came with a little side salad all cut up very small, perfect for little fingers. The really friendly waitress suggested the girls has their main courses at the same time as our big bowl of nachos starter. This turned out to be a great strategy and once we were ready for our main event the girls we shovelling away chocolate brownie and ice cream. Result. The Nachos portion was generous and came fully loaded with the sour cream, salsa, guacamole and jalapenos, just as you would expect. Delicious. We decided to give the new additions to the menu a go. I had the Havana Club & Jerk glazed pork ribs with sweet potato fires. I love ribs, and these were delicious. Plenty of meat on them, really addictive dipping sauce and just the right amount of fries. Dan tucked into the revived Chili Con Carne, which was served in a rustic bowl, complete with a lid. It looked lovely, and very homely. (Not that I have ever served anything with such style at home!) I managed to taste a bit before Hubster polished it off: I need the recipe. There were succulent pieces of beef which totally appealed to the carnivore in me. Thumbs up. Darcie ate her entire plateful which isn’t the norm for her, this in itself is a reason to come back. The kid’s portion sizes were spot on it. The desserts were dented but the girls were beaten, it was a tough job, but I had to finish them off. Great brownie, and a lovely vanilla ice cream. I must mention The Facilities, you can’t go out with small children and not pay them a visit. The cleaner the better and on some occasions they have been enough to put me off returning somewhere. So, the make or break was The Pit Stop. There was a separate baby changing room, it had plenty of space to host the toddler nappy party. And it was clean: hurrah. The main loos were also clean and would have had plenty of space to wheel the buggy in there had I needed too. To conclude, we actually enjoyed ourselves as a family. Together. Out out! The food was on point and is perfectly positioned to entice the family market. The staff are well versed in little people: buggys don’t scare them nor did the odd scream. There were plenty of menu options including gluten free and vegan, the food quality was great. The girls seemed occupied, happy and the prompt service meant boredom didn’t sweep in until Bill time. The meal came to £55 for the 4 of us, 2 courses each and drinks- including my boozy beverages. Thank you Las Iguanas for showing us that we can socialise with our girls in public, and not just at the soft play café. We will be back.